Adeline's Sea Moose provides a top-notch venue, attentive crew, and First Mate services to help make corporate yacht parties and events a huge success! Your search Chicago yacht parties and events are over for sophisticated venues, you hit the jackpot with Adeline’s Sea Moose for private yacht parties. Adeline’s represents value in an elegant atmosphere of comfort, intimacy, romance and decadence of a bygone era once forgotten. You can even say she breathes new life into events and yacht parties in Chicago! Beyond the ordinary Chicago yacht parties and events, Adeline’s Sea Moose is a vibrant, mystical experience of contemporary urban chic sophistication. As evening blankets downtown, the music and lights intensify into a burst of color and sound casting an alluring spell. 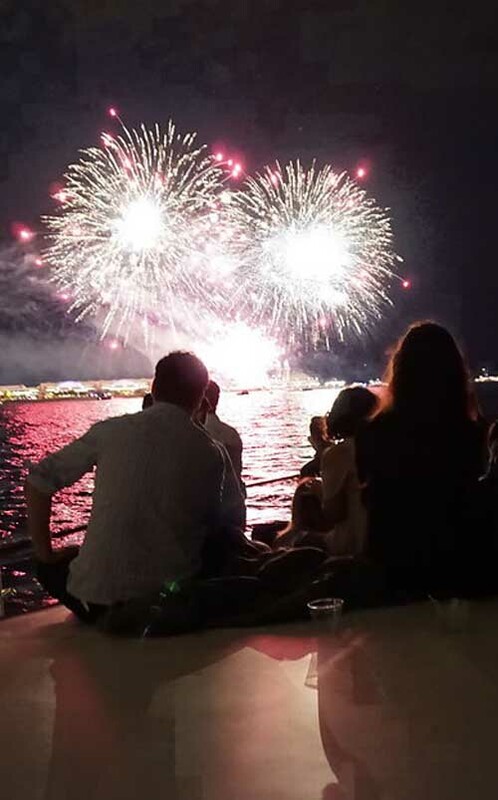 Adeline’s private Chicago yacht parties and events will excite, refresh and sooth in equal measure – a perfect destination for yacht parties and events that exudes elegant simplicity with style! While you’re enjoying your complimentary drink slipping out of your shoes and on to her deck, you’ll quickly realize there is something uniquely different about this yacht party event. From the greeting and the handshake of the Captain to the warm smiles of the gracious crew, you’ll immediately start to decompress and relax knowing you’re in exceptional hands and headed for an incredible event while partying with all your friends and family. After that, it’s happy hour for the duration of the party. This beautiful yacht provides you a welcome escape from the urban jungle for boat parties and events! She was built with an overall length of 68 ft. and is a prized vintage jewel, with its masterful blend of power and grace, she virtually glides you thru the water aboard “your very own” floating playground for food, drink, merriment and what surely will be an unforgettable venue for yacht parties and events in Chicago.